Winter invariably means there's less to do outside, especially in temperate parts of the world where short days and depressed temperatures make for a very quiet time indeed. Of course, there are always preparations to be made for the coming growing season: compiling seed lists, overhauling tools and digging (ground conditions permitting). But if you're anything like me that's simply not good enough – you'll want to be actively growing something! If you are frustrated by the long wait there is one sure-fire way to get your fix. Kitchen-grown sprouting seeds, or simply 'sprouts', will keep your green fingers busy until it's warm enough for spring sowings to begin outside. Sprouting seeds are simply seeds that are germinated and grown on to produce their first root and shoot. The whole process is insanely quick – as little as two days and rarely more than a week – allowing you to enjoy a steady supply of nutritious sprouts throughout the darker days of winter when home-grown salads can be thin on the ground. Sprouts are deliciously crunchy and give a welcome source of freshness at this tiresome time of year. Just about any vegetable or herb seed can be sprouted and eaten in its infant stage, though there are some usual suspects perfect for this purpose, including alfalfa, sunflower, fenugreek and radish, along with legumes such as the mung bean (the common Chinese beansprout), adzuki bean, lentils and peas. Each type of sprout brings its own distinctive texture and flavor, making them invaluable as salad ingredients, garnishes, soup toppings and more. The journey begins with the right seeds. While some gardeners suggest that sprouting seeds is a good way of using up any veg patch surpluses, it's perhaps best to stick to seeds sold specifically for sprouting as seed for sowing outdoors may have been treated with chemicals to aid germination – but certainly not human digestion! Another safe source of seed is health food stores, who sell some of those listed above. Bigger bags mean that this avenue works out much more economical, so check here first. With your seeds in tow you now have a choice of how to sprout them: by using a jar, sprouting kit or the sack method. Which you plump for depends on what you're growing and whether you anticipate becoming a sucker for sprouting! Any seeds can be sprouted in an old, squeaky-clean jam jar or similar vessel. This readily available is a great way to dip your toe in the water to see if sprouting's right for you. Begin by adding one to two heaped tablespoons of seed to your jar then fill with water. Don't be tempted to add more than this, as the seeds will swell up to 30 times their original size. Leave the seeds to soak overnight for a minimum of eight hours and up to 24 hours for larger seeds or beans. Soaking the seeds primes them for germination – think of it as a wakeup call for the sleeping seeds. With soaking complete drain the water off. This is best done by securing a cut-to-size square of muslin, cheesecloth, gauze or similar free-draining cloth over the mouth of the jar using a tight-fitting elastic/rubber band. Tip the jar upside-down to drain, holding the muslin in place by hand just in case the elastic band fails and the whole lot comes sloshing out. After draining, gently tap the muslin to dislodge any attached seeds. Keep your seeds in a warm, dark place to commence germination. Seeds now need rinsing twice daily – as you make your breakfast and again when you prepare your evening meal. Simply fill the jar with water, gently swirl the seeds around, then drain off as above. Keep the muslin cap in place between rinsings to prevent the seeds from drying out and to reduce the risk of contamination from airborne moulds. The sprouts are ready to eat once they have reached 1-5cm (0.5-2in) long (exactly when is a matter of personal preference). Bring them out into the light a day or two before eating so they can take on some color and improve in flavor. 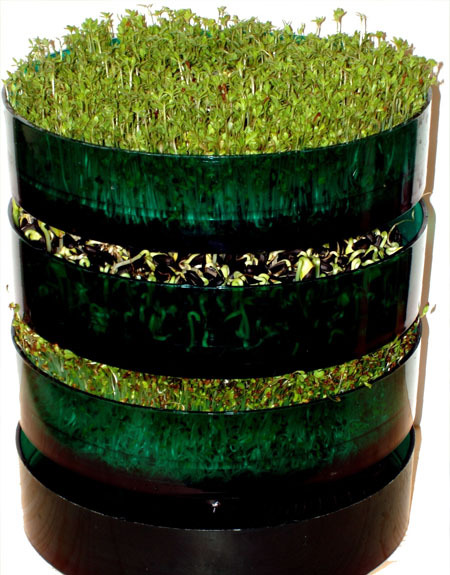 Sprouting kits are a logical progression from the jar method. They are cheap to buy and make an easy process even more straightforward. Kits consist of two or more tiers of trays, each with slats in the base to allow the water to pass through. The trays give welcome flexibility, allowing different types of sprouts to be grown in each of the trays, or different stages of growth to be had to ensure a continuous supply of supremely fresh sprouts. Rinsing the sprouts is a doddle. Run the entire kit under a steady stream of water and allow the water to drip through the trays below and out through the bottom tier. A reservoir catches the remaining drops of water and can be emptied a few minutes after draining. Keep your seeds in the dark to germinate and bring them out into the light before eating the same way as if sprouting in a jar. Purpose-sold sprouting sacks are hessian/burlap sacks used for sprouting beans that's don't require any light at any stage of the process. You can make your own drawstring version from any permeable material, including cotton and linen fabrics. Pop your pre-soaked seeds into the sack to germinate. To rinse the seeds, simply dip the entire sack into water for one minute twice daily. Move the seeds about within the bag by jiggling the sack within the water. This has the added benefit of preventing them from rooting into the fabric. Hang the sack up to drip-drain between dunkings. If you want to replicate the thick shoots of store-bought beansprouts there's one final trick to employ. The shoots only thicken out if pressure is applied to them; like a weightlifter pumping irons to bulk out muscles, applying pressure means the shoots have to grow stockier to counteract this extra force. You can achieve this by positioning a weight on top of your beans as they germinate and grow. A water-filled sandwich bag or a chunky chopping board would work well. Enjoy your sprouts as fresh as you can. Just-harvested sprouts will be chock full of vitamin C and other vitamins and minerals, giving a nutritious hit that belies their size. The sprouts will keep for up to a week in plastic bags popped into the fridge. Give them a rinse after three days to preserve their freshness and keep them crunchy. Watching the seeds germinate and sprout is truly fascinating and something we don't get to see out in the vegetable garden. With so many sprouting options there's no reason your indoor sprouting garden can't be every bit as diverse as your outdoor one. "Timing!! I just bought my first kit today! Thanks for helping and I enjoyed some of the non- american words you used." "Hi Kelly. That's great news - have fun discovering all the wonderful sprouts that can be enjoyed. I'm sure you will succeed and have something to sprout about!" "Thanks for the reminder for me to dig out my sprouting trays.Ilove sprouting seeds! I don't always have success with sprouting. I've had them NOT sprout...especially mung beans,ending up smelling rather musty...so I threw them out. Could it be too cool for a successful/healthy sprout, or old mung beans? " "Hi Gaia. Your mung beans might not have sprouted because they were too old or physiologically damaged in some way, rendering them dead and unable to germinate. And as you suggest, the other reason may simply be that it was too cool, so that the germination process took too long. Ideally most seeds need to be at room temperature (20C/68F) or thereabouts to germinate speedily. The quicker you can get them to germinate, the less the chance of disease/rot getting there first. Try it again with fresh seed - and good luck!" "I have been regularly sprouting for decades but thought I'd still skim your article anyway. Your tip about how to thicken the shoots of mung beans was completely new to me. Just goes to show: everyday is a school day. Thanks very much. I'm getting straight onto it!" "Thanks Kathryn. I'm a firm believer that the more you learn, the more you realise how much there is still to learn! Good luck with this year's sproutings." "Hi Kelly. That's great news - have fun discovering all the wonderful sprouts that can be enjoyed. I'm sure you will succeed and have something to sprout about! https://vbwiki.medicine.tamhsc.edu/groups/homework2/weblog/9fd1e/How_Social_Networking_Affecting_Our_Lives.html"
"suggest any non poisonous chemical for even and easy sprouting of the seeds." "Is it possible that Benedict Vanheems can let me have the tip on how to thicken the shoots of Mung Beans. This is my first visit to your website"
"Hi Nelis. All you need to do is to apply pressure on top of the mung beans in between rinsings. Simply get something with a bit of weight to it (but not too much!) that can be placed snugly over the top of the beans - perhaps with a clean dish cloth or similar between the beans and the weight. Keep the weight in place as the beans grow so they have to bulk out to push up against it. One idea for the sprouting kits pictures above would be a neatly-fitting plate placed over the top of the sprouting tray and weighed down with, for example, a bag of flour." "Having sprouted briefly some years ago, I got fed up with not being able to get rid of the bean/seed skins which were unsightly and unpleasant to eat. Any ideas on this?? " 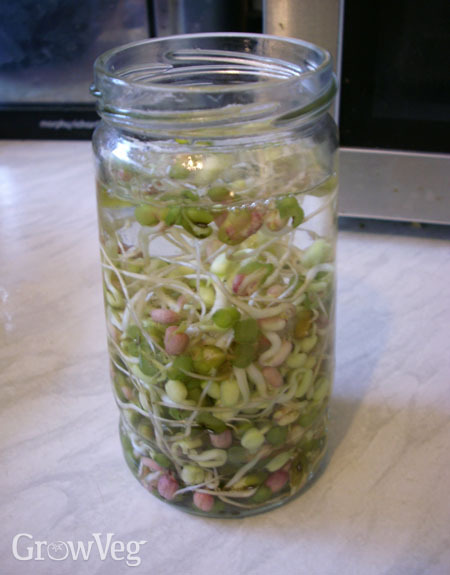 "Allow sprouts to grow until they have shed their husks. Place in a basin of water and some of the husks will float, remove with slotted spoon. Most husks will remain in bottom of basin,so just remove sprouts with slotted spoon." "Thank you David, I had tried this many yrs ago when firtst starting to sprout, bit of a so-so result but will try again. Also, it might be better to grow seeds on kitchen paper and snip them along their length rather than keep in a jar. I will try both. Rachel"
"To Thicken The Shoots On Mung Beans: Are we talking about a bean sprout that "nice long,thick bean sprout I buy at the store. I thought that finished sprout was Mung Beans...is it? I am always disappointed in the small sprout of the mung bean that I sprout. Thanks Benedict, I will try your method." "are mung bean seeds from a plastic pack (tanderoo brand 325gms from australia) ideal for sprouting?" "Hi Freddie. I have sprouted mung beans from a packet sold for food before with no problems. I can't vouch for the brand you are suggesting, but I'd say give them a go." "Thanks, bro... i have been growing on experimental basis mung bean sprout, trying to find out which one (process) could give me a nice stem, without roots... roots are a pester, as they take time to remove... any comment on this... cheers! i am based in papua new guinea and i am getting mung beans from malaysia and Australia..."
"how can I find freggie bags for sprouting." "Hi Almeta. I haven't heard of freggie bags. Can anyone else help with where to find them?" "i found a sprout in my compost heap with roots will it grow if i plant it "
"Hi Guy. Quite possibly - maybe try planting it up and see if it grows. Would be interesting to see what it grows into." "Thanks for the easy to understand video. I am going to try the Jar method. "